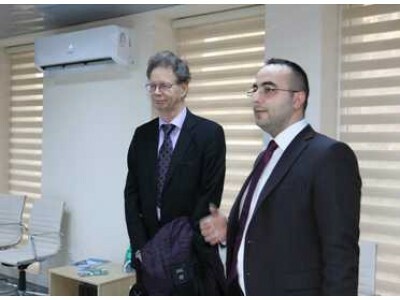 aniel Ivarsson, chief procurement consultant at SIGMA programme, being a joint initiative of the European Economic Cooperation and Development Organization and the European Union, visited the “One Stop Shop” Export Support Center of the Center for Analysis of Economic Reforms and Communication (CAERC). CAERC Manager Nijat Hajizade gave detailed information to the guests, saying that the “One-stop-shop” Export Support Center jointly with Azexport portal and Digital Trade HUB remained to be an ecosystem which served for the promotion of exports. N. Hajizade added that in the "One stop shop” Export Support Center there are 5 state agencies, 7 state services (including, services of issuing permits on origin, veterinary, phytosanitary, quality, etc.). Moreover, submission of Electronic Customs Declarations at the "One Stop Shop" Export Support Center facilitates the work of entrepreneurs. Because, entrepreneurs get all the procedures for exporting in the same space in the shortest possible time and with less resources. Daniel Ivarsson, chief procurement consultant at SIGMA programme, being a joint initiative of the European Economic Cooperation and Development Organization and the European Union, expressed his satisfaction with this successful project. He said that such progressive initiatives are recognized by international organizations. It should be noted that the "One stop shop" Export Support Center was established on the basis of the Decree of the President of the Republic of Azerbaijan dated 22 February 2017 with location in the building of the Center for Analysis of Economic Reforms and Communication (Landau 16, Baku, http://iqtisadiislahat.org/contact-us).